As a frequent international traveler, I’ve come to depend on Global Entry — a system that allows me to clear US customs in under three minutes. While the process of getting or renewing membership may seem intense, it’s actually relatively painless, and the service continues to exceed my expectations. Here are some important things you should know if you plan on getting Global Entry, including how you can get it for free, what to expect during the interview, how to use it, renew it and more. All Global Entry applications must be submitted online through the US Customs and Border Protection website, along with a $100 nonrefundable application fee. After you’ve received conditional approval, you’ll need to schedule and complete an interview. Plus, The Platinum Card® from American Express and The Business Platinum® Card from American Express waive the fee even for additional cardholders. So, if you pay the $175 standard fee for three authorized users (See Rates & Fees) ($300 per authorized user for business cards; See Rates & Fees), they can all get rebates for their own Global Entry memberships. Most of the credit cards that offer an application fee waiver allow you to buy Global Entry for someone else. So if you know someone with an unused credit on their Amex Platinum, for example, they can charge the fee for your Global Entry renewal and it will be rebated on their account. It’s worth noting that with some cards, you may not see the credit on your statement for up to eight weeks. Another way to get Global Entry for free is to have Platinum or Diamond Medallion status with Delta. As part of Choice Benefits, Delta Platinum Medallion members can receive a $100 voucher toward Global Entry enrollment. Delta Diamond Medallion members can receive two $100 vouchers and get to select another choice benefit. However, this is absolutely not the best way to get reimbursed for Global Entry. If things are backed up and your scheduled interview time seems like forever away, you can always try getting a walk-in interview. Many TPG readers and team members have had success showing up for an interview without an appointment. Or, consider an interview upon arrival at a participating airport (more on that later). Once at the facility, you may have to wait a bit if the Customs and Border Protection (CBP) officers are busy. I waited about 15 to 20 minutes for my interview on a Friday morning at the Chicago Enrollment Center, but one former TPG editor didn’t have to wait at all for her interview at a center in Los Angeles. During the 10- to 15-minute interview, expect to be questioned about your application, or why you want to join the Global Entry program. The officer I had was both friendly and professional, and asked to see my conditional approval letter, passport and driver’s license. I was then asked to confirm some of the countries I had visited recently (as listed on my application) and whether I’d traveled to each for business or leisure. The final step was giving my fingerprints and getting my photo taken (make sure to brush your hair on the day of your interview). A few minutes later, he told me I was officially enrolled, and that I would receive my official Global Entry card within seven to 10 days (which I did). I was then given my KTN (Known Traveler Number) so that I could enter it in my frequent flyer profiles and be eligible for TSA PreCheck. Don’t forget to activate your card in your account within 30 days of receiving it, though you don’t necessarily need it to pass through Global Entry kiosks, which I’ll explain below. Some CBP officers will provide actual kiosk training, but mine did not. Once you’ve been approved, using Global Entry is easy. You simply head toward the line (or lack thereof) that says Global Entry when you arrive at immigration. Approach the kiosk, use your fingerprints to identify yourself — sometimes this takes a few tries — answer the questions (you’ll recognize them from the blue CBP entry form) and take your photo. Then, proceed to baggage claim. 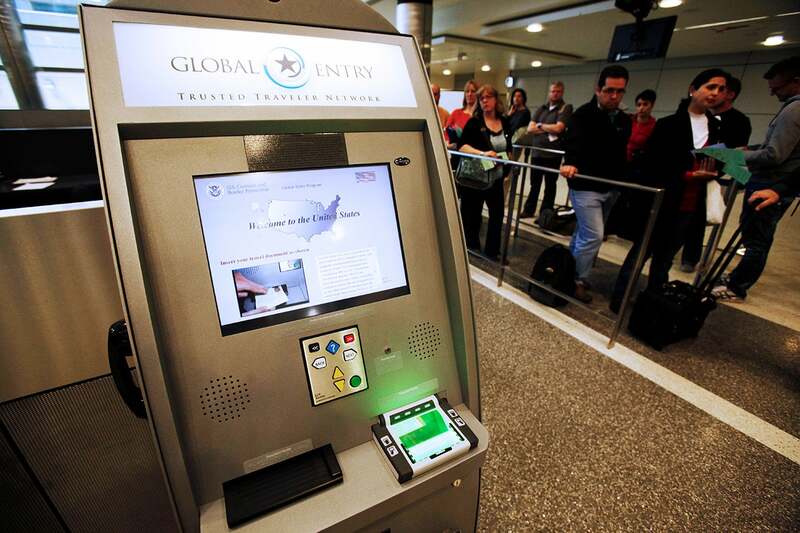 You actually don’t need your Global Entry card to go through Global Entry kiosks in the US, but you will need it going through NEXUS or SENTRI points at the Canadian and Mexican borders when coming back into the US for expedited entry. Entering your KTN in your frequent flyer profiles should ensure that you’re eligible for TSA PreCheck. I’ve personally never been denied PreCheck since receiving Global Entry, but some TPG readers report they have occasionally been refused the privilege. In any case, you should have TSA PreCheck almost all of the time if you have Global Entry. UK citizens can apply for Global Entry. Global Entry service is actually available to more than just US citizens and permanent residents. Citizens of Argentina, Germany, Switzerland, Mexico, Panama, South Korea, India, Colombia, Singapore, Taiwan and the UK are also eligible. Canadian citizens and residents are also eligible for Global Entry benefits through the NEXUS program. For more information on how citizens from other countries can apply and get approved for Global Entry, check out the requirements and information on the CBP website. The application process for UK citizens is slightly different: British citizens need to first register through their government website and pay a £42 (about $53) fee. If approved by the UK government, UK citizens can then apply through the US Trusted Traveler Programs website and pay a $100 fee to the US government. When Nicky Kelvin, a UK-based TPG staffer, applied for Global Entry, he mentioned that the UK government approval came through “incredibly fast, confirmed just 30 hours after application.” He noted that his Global Entry application took a bit longer, closer to six weeks, and recommends that applicants log in to their account regularly as he wasn’t automatically notified of approval. His interview appointment at New York-JFK was easy and quick. If you’re a US citizen thinking about getting Global Entry and you visit Canada often, you may want to consider getting NEXUS so you can also have expedited customs there. Clearing Canadian customs and immigration can take a while, so this would save you a lot of time. NEXUS is actually cheaper than Global Entry and once you have it (as a US citizen or permanent resident), you also get Global Entry and TSA PreCheck. The downside is you must go to an enrollment center located along the Canadian border. If you’re having trouble booking an appointment or don’t live close to an enrollment center, you can enroll upon arrival at airports within 23 US states plus Canada. This service allows you to complete your Global Entry enrollment interview as part of the immigration process when arriving at the airport after an international trip. In order to do this, plan to follow signs in the airport for the “Enrollment on Arrival” lanes. A CBP agent will then complete your Global Entry interview during your admissibility inspection. No other documents are needed other than your “requisite documents for international travel,” like your passport. If you don’t see any signs for this, ask a CBP agent. For more information, you can read a detailed account on how one TPG writer was able to get his Global Entry approved in JFK’s Terminal 1 after a trip to China. Global Entry membership lasts five years before it must be renewed, and it always expires on your birthday that fifth year. In late 2018, many members saw increased delays associated with renewals, where cards were taking more than two months to arrive, or no email reminders or updates being sent. This may been due in part to an increase in summer travel, as well as a general increase in Global Entry applications (up from 1.6 million in 2016 to 2 million in 2018). But delays can easily be avoided by doing one key thing: applying for a renewal before your Global Entry expires, because CBP will give you a six-month grace period while your application is processed. And you can always apply for renewal a full year before it expires, especially if you’re worried about the summer backup. Parents can’t bring their babies or children through the Global Entry kiosks with them unless they, too, are enrolled in the program. This means you’ll have to pay the $100 enrollment fee for each child you’d like to enroll. You’ll also have to schedule and attend another interview with your minor. While the interview will just be a formality, you will have to show up — and this makes the enrollment upon arrival service extra handy. TSA PreCheck benefits, however, extend to children 12 years of age and young, so you can use the expedited lane together when traveling domestically. And the Mobile Passport app also allows you to create additional profiles for family members, and families of up to four people can submit a single customs declaration form. If your family doesn’t leave the country often, that may suit your needs better than Global Entry. Extra fees aren’t required for children who use NEXUS with their parents, or for children linked to the parent’s SENTRI profile. If you get a new passport (perhaps it was lost, stolen or simply expired), you can update your Global Entry profile to match your new passport. Simply log in to your account, navigate to your dashboard on the right and find the section marked “Update Documents” Here, you’ll enter your new passport number there. However, if you do have a name or status change, you will have to go to a Global Entry Enrollment Center to process that change. Featured photo by Katherine Frey/The Washington Post/Getty Images.